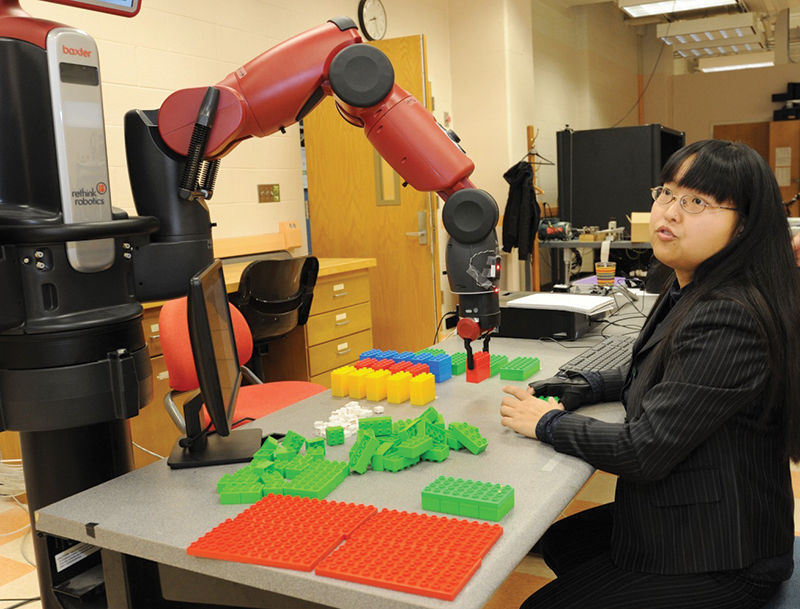 Sophia Wang works with a robotic arm in her lab. Two faculty members have received a total of $1 million in funding as part of the National Science Foundation’s highest honor for junior faculty members. Jacob Sorber and Yue “Sophie” Wang were among the honorees in this year’s Faculty Early Career Development (CAREER) Program. Each has been awarded $500,000 for research. Sorber’s research enables low-cost, low-power sensors to gather data for long periods of time. The sensors would be powered by energy from environmental sources, such as the sun, with no need for batteries or manual recharging. He said the sensors have the potential to transform science and society. They could, for example, be used to monitor human health, growing conditions in greenhouses or the behavior patterns of animal populations in the wild. Wang is focusing on two distinctly human attributes — trust and regret — to develop new “control algorithms” and decision-making strategies that would help humans and robots work together to be more productive. She sees big opportunities for humans and robots to collaborate in manufacturing. Wang also sees high potential for “human-supervised mobile sensor networks.” Robots could begin doing low-level simple and repetitive tasks while humans could be involved in high-level complex tasks, she said. While research is central to the award, winners also must be excellent teachers and have proven themselves exemplary in integrating research and education. Selection is highly competitive. Sorber is an assistant professor in the School of Computing, and Wang is an assistant professor of mechanical engineering.